Saturday, MAY 11, 2019 RegistER NOW! You can expect a hands-on day of outdoor fun in nature! Presenters share insights and activities based on their work in nature preschools, forest kindergartens, or other nature-based programs in public schools. 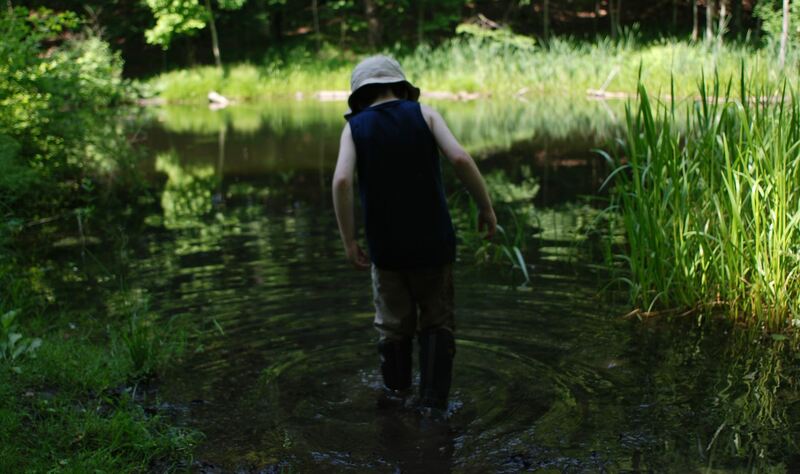 Training has two tracks: one for educators working in public or traditional schools, and one for educators working in nature preschools, forest kindergartens, and other nature-based program settings. Light breakfast and lunch are included on Saturday, but bring your canteen for drinks. In addition to interactive workshops, our hosts at the Lime Hollow Forest Preschool will offer an informal tour of their indoor space and their lovely forest haunts during lunch. What happens when a kindergarten teacher commits to taking her students into the woods every week? Science! Math! Language! Friendship! And then? First graders in the forest and sixth graders at the stream. Excited principals and reinvigorated teachers. 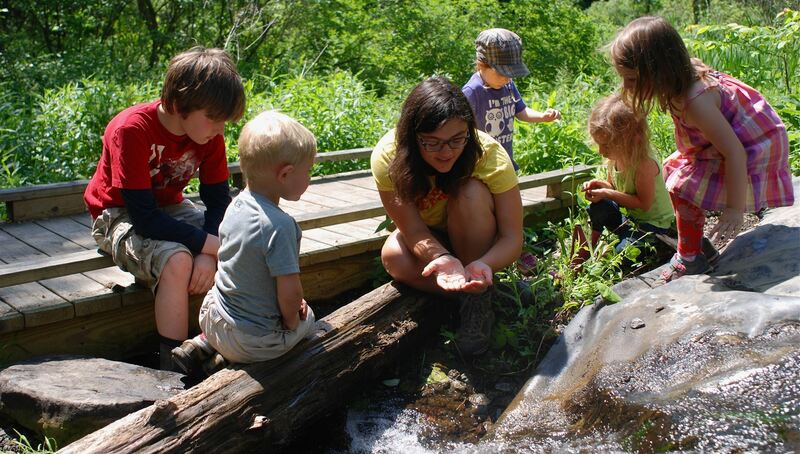 In a presentation that shares stories from four Vermont elementary schools, learn the components of sustainable nature-immersion and the inspiring results. Eliza Minnucci was raised in Deerfield, New Hampshire but now calls Tunbridge, Vermont home. Before teaching Kindergarten in Quechee, she taught young children in Zihuatanejo, Mexico, Chicago, Seattle and Fort Yukon, Alaska. On hiatus from the kindergarten classroom, she supports teachers in cultivating nature-based play and learning for their students through consultation and teaching the Nature-based Early Childhood Curriculum course at Antioch University New England. She is a frequent presenter at In Bloom conferences throughout New England. She is the author, with Meg Teachout, of A Forest Days Handbook: Program Design for School Days Outside, published in 2018. Registration and light breakfast | 8:30-9 a.m.
First Gathering | 9-9:15 a.m.
Keynote: Everything I Need To Know I Learned in Kindergarten | 9:15-10 a.m.
Building a Curriculum Based on Documentation | 10:10-12:10 p.m.
How do you design/develop a curriculum that not only incorporates the interests of the children, but also aligns with State standards using documentation for nature-based schools? With just one simple question, a child's inquisitive mind and thirst for knowledge can quickly become the focal point of a program's curriculum. During this workshop, participants will gain an understanding that by observing and listening to children about their interests, a curriculum can quickly develop that helps drive the learning process within a nature-based school for the year. Participants will begin the process in developing a curriculum that meets State standards, but still incorporates the philosophy and mission of their program. First Steps: Academics Outdoors | 10:10-11:05 a.m.
For teachers just starting to spend more time outside Eliza offers an introduction to setting familiar K-2 lessons outdoors. Lessons and practice of syllables, sight words, word problems and the like can easily be taken outside and can help both teachers and administrators make the transition from traditional inside teaching towards more developmentally appropriate outdoors practice. Experience a series of these mini-lessons and get a feel for an approachable straightforward translation of academics, while taking advantage of an outdoor setting. Music and Nature: Core Routines with Song | 11:10-12:10 p.m.
Making music together is truly a 'survival skill:' our ancestors sang and danced together in small communities for countless generations, without any requirement that participants be 'talented.' Singing has the magic of both energizing and calming us. Singing in a group synchronizes our heartbeats, regularizes our breathing, releases endorphins and oxytocin, all of which create a sense of well-being, mutual trust, and pleasure in togetherness. No matter the 'quality' of the singing, it improves our immune and circulatory systems, sleep, posture, communication skills, and mental alertness, all while decreasing stress, anxiety, depression, anger, and loneliness. This cultural mentoring session will offer activities in which song/sound can nurture healthy connection within our individual selves, with the natural world, and within our community/class. We'll consider how to blend sound with core routines of nature connection, such as combining Nature Names with a classic American folk song, and explore how to identify songs that suit where we are externally and internally in the Natural Cycle. Along with being a joyous way to express the stories of local species, landscape, and waterways, and to honor the full spectrum of human emotions, song also helps us flow more gracefully through transitions, and manage individual/group behavior in a way that is playful yet highly effective. No matter what your perceived skill with singing, come gather to remember how we all benefit from raising our voices together, and go forth with activities the future generations will treasure! Lunch with Open House Tour of Lime Hollow Forest Preschool | 12:10-1 p.m.
Kindergarten Readiness in Forest School | 1-3 p.m.
What do we mean by "kindergarten readiness" and how do we seamlessly support children through nature connection? The Outdoor Life Learners team will dispel myths and share how children develop skills through outdoor learning and play. Pooping in the Forest, Sleeping in the Trees | 1-1:55 p.m.
What does a forest school teacher need to carry in order to care for the needs of a group of children in the woods? We have been working this out for five years, with the two most recent years under OCFS regulation, and would like to share what we've learned. How do children eat, poop, nap and learn while in the forest? What should a forest savvy educator bring along to ensure that nature experiences are enjoyable and positive learning experiences? Primitive Skill Share | 2-3 p.m. Learn how to build basic debris shelters that are sturdy and safe for children to play in and on. Try your hand at simple knots and lashing, then learn how to construct the skeleton to hold your shelter together. Trauma, Stress, and Self-Care Session | 3-4 p.m. Closing Gathering with reflection, evaluation, and PD certificates | 4-4:30 p.m.